Clematis stem (Mutong)-Aristolochia manshuriensis Kom. Botanical Name: 1. 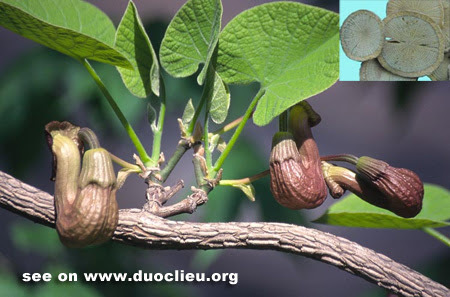 Aristolochia manshuriensis Kom. ; 2. Clematis armandii Franch. ; 3. C. Montana Buch.-Ham. Common Name: Akebia, Clematis stem. Part Used & Method for Pharmaceutical Preparations: The stems are gathered in spring or autumn. The bark is removed, and the stems are dried in the sun. 1. Damp-heat in the urinary bladder manifested as dysuria, painful urination, frequent urination, urgency of micturition and abdominal distension and fullness, or flaring up of heart fire manifested as ulceration of the mouth and tongue, irritability and blood in the urine. Clematis stem (Mutong) is used with Bamboo leaf (Zhuye), Licorice root (Gancao) and Fresh rehmannia root (Shengdihuang) in the formula Daochi San. 2. Insufficient lactation. Clematis stem (Mutong) is used with Vaccaria seed (Wangbuliuxing) and Pangolin scales (Chuanshanjia), or Clematis stem (Mutong) is cooked with pig's feet. Cautions & Contraindications: Avoid giving overdosages of the herb. It is contraindicated during pregnancy.